Canadian jazz pianist/composer/vocalist Jillian Lebeck is one of the most dynamic and exciting voices on the Canadian Jazz scene. Her debut recording Living in Pieces (Maximum Jazz/Universal) spent several weeks in the number 1 position on the national Chart Attack radio charts. She is an alumni of the prestigious Berklee College of Music. Her projects have been featured on CBC Radio’s Studio One Jazz Series during the Vancouver International Jazz Festival and she has received regular airplay on CBC’s Hot Air, After Hours, l’espace musique, The Signal, KPLU, and NPR. She was recently a jury member for CARAS JUNO Awards. 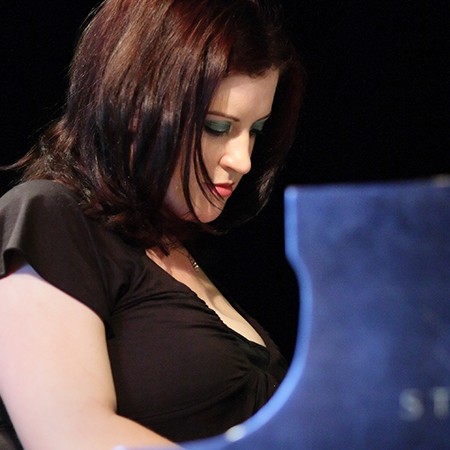 Jillian has opened for legendary jazz saxophonist Joe Lovano and New York jazz pianist – Bill Charlap. She has toured Canada including dates at the National Arts Centre in Ottawa, at the Montreal International Jazz Festival, The Top of the Senator in Toronto, as well as Calgary Jazz Festival, and Medicine Hat Jazz Festival. In Europe she has performed in Sicily, the Netherlands, Germany, France, Portugal, UK, and Spain. She recently performed in Portland Oregon, for the PDX Jazz Festival.Her second release as a leader was released in June, 2007 Songs and Melodies on talie Records.